Those Final Ten: Did ya know? The average brat has 25 grams of fat. Which gives me 25 reasons why they are so darn delicious. I love me some brats. Mmm … juicy, greasy brats. And, throw in a beer, will ya? Heaven. However, since I’ve started turning over a healthier leave, I have been desperately trying to get brats off my radar. And my answer to that is: Not even close to the same thing and not worth my time. Growing up in Milwaukee, you get to know a good brat. Nothing substitutes the original. But, avoiding brats and burgers and other delicious things with 3574385413 grams of fat at Brewers tailgating sessions has proven to be quite difficult for me. Everything smells so delicious, and with at least 15 more games I will be attending this season, I could be in some serious trouble. I’m not saying I never want to eat another brat again in my whole stinkin’ life, because they would be the biggest darned lie in the world. I just want to consume them in moderation, instead of three and a half at every one of the 20 Brewers’ games I’ll be going to. Tonight, we will be going to a game (It’s going to be beautiful tailgating weather.) and I think I have devised a plan. Call me crazy, but I’m planning on bringing chicken smothered in BBQ sauce (ok, not smothered, smothered is just a much better adjective than ‘with a light coating of’), corn on the cob, and some left over asparagus from last night’s dinner. I don’t know how these little chubsters can race at every game. They have like 99.9% body fat. 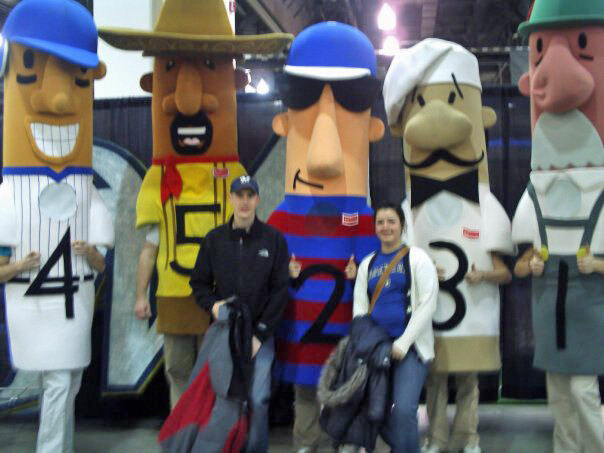 (Sorry about the blurry pic, just wanted evidence of the racing sausages. P.S. That very same Brewer’s t-shirt no longer hugs my midsection. It’s actually quite baggie. Thank the Lord.) Also, please note that three of the five sausages are giving ‘thumbs up.’ Love it. I’m sure I will be made fun of. I’m sure I will be tortured. I’m sure I will be excommunicated and burned at the stake. OK, maybe a little bit of an exaggeration. Anyways, I cooked up the chicken, corn, and asparagus before hand, making it really easy to just bring it to the game and heat it up over the grill. And, I just know it will be delicious and my arteries will be very happy with me. Your welcome arteries, don’t even mention it. Maybe they’ll make a new racing sausage, except it will be a chicken breast. And, they’ll name it after me. And if anyone makes fun of me, I’ll kick ‘em in the shin and tell them their brat has 25 grams of fat in it.